Scary hurricane graphic from the news. We are almost at the end of hurricane season and New Orleans has emerged storm free. 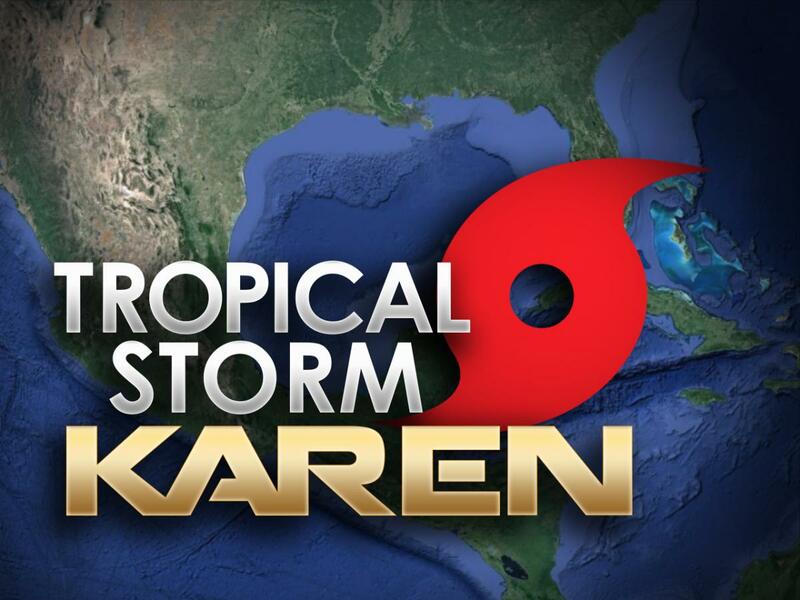 A few weeks ago it seemed the city would be hit by Tropical Storm Karen. The power of a tropical storm pales in comparison with higher-grade hurricanes, but the memory of Hurricane Isaac last summer filled me with dread about the potential of another set of days without electricity or something far worse to disrupt our fragile city. This recent storm threat had me pondering the hurricane mindset accompanied with growing up in the South. The start of hurricane season on June 1 always makes the news and through the end of November, checking the weather requires a tertiary look at the tropics and the Gulf of Mexico for storm activity. I even know what times the National Weather Center posts their hurricane updates. In Washington D.C. (where I used to live) it was the lack of conversation about activity in the tropics that made me realize that hurricanes are pigeonholed as regional news across the country. I didn’t miss the pre-storm shopping frenzy and drumbeat of doom fostered by the media, but unless a hurricane made landfall, the threat of a hurricane never made news up there. I moved to DC shortly before Hurricane Katrina made landfall, and I didn’t even know a hurricane had formed until it came ashore in Miami. 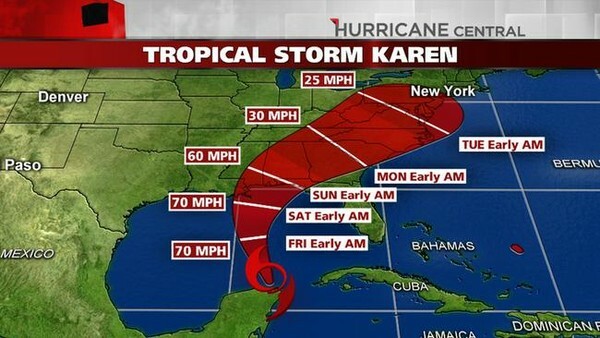 Screenshot of Tropical Storm Karen’s projected path. It’s pretty depressing, but by wishing a hurricane changes direction you’re essentially hoping it hits someone else. The morose biproduct of watching the path of a hurricane so closely is that you hope the hurricane shifts away from your city– essentially hoping it goes and hits someone else. In Miami, where I’m from, the hope was that it would turn and dissipate somewhere in the Atlantic. Here in the Gulf South, a slight turn is a sigh of relief for New Orleans. But if you really consider it, you’re just relieved you’re not in West Louisiana or Mobile Bay. Growing up within this culture also helped me retain information about the science of hurricanes. I think this is unique to areas threatened by hurricanes, simply because we are inundated with news information about them from the time we are very little. I can barely tell you why it rains, but I know that warm waters strengthens a hurricane. 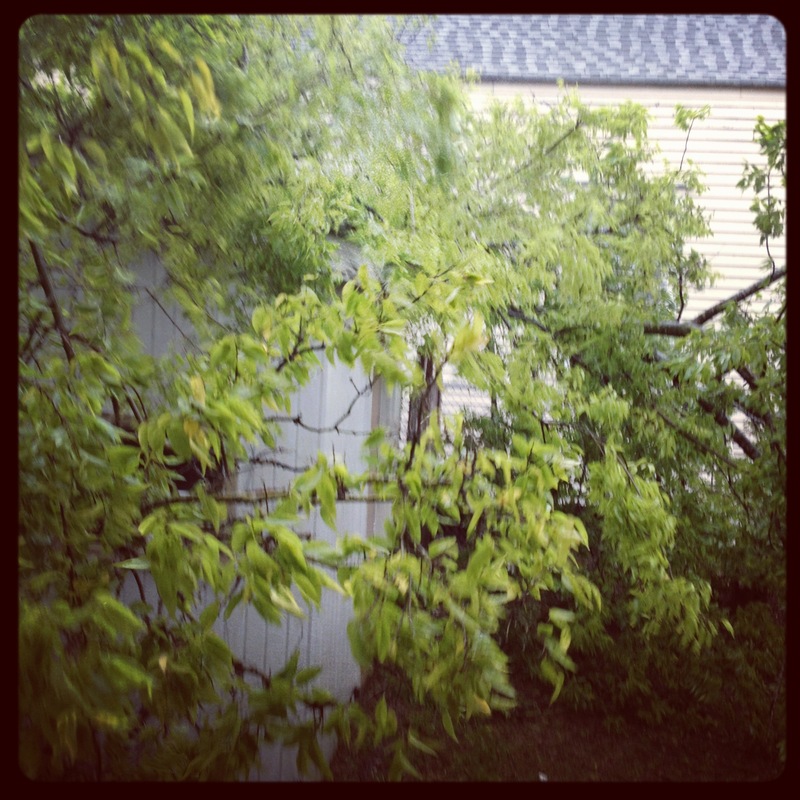 The branches of a downed tree in my yard, after Hurricane Isaac in 2012. I wonder if this the same for other regions affected by severe weather? I assume not because earthquakes and tornados don’t have the same predictability. Do regional differences influence the way the weather is covered in your area?